DSA SF has joined a coalition of community groups in standing up and fighting back against a push from the right-wing San Francisco Police Officer’s Association to equip the San Francisco Police Department with deadly Taser weapons, and we need your help! Reuters has reported that over 1,000 people have been killed by police using Tasers, and we’ve seen some of those deaths occur here in the Bay Area, including a man killed by police using Tasers in Oakland this Fall. Studies show that Tasers don’t reduce police shootings, they simply add another weapon to the arsenal, at a time when we should be focusing on de-escalation tactics and community-led violence reduction programs that actually work. Tasers, like all police violence, target the most vulnerable members of our community, including the poor, the unhoused, people of color, and those experiencing physical or mental health crises. DSA SF is committed to standing in solidarity with the poor and working class against police violence and racism. DSA SF members have been organizing with community groups, researching Taser studies, and meeting with members of the San Francisco Police Commission, the body that will ultimately decide whether or not to allow the police to carry electroshock weapons. 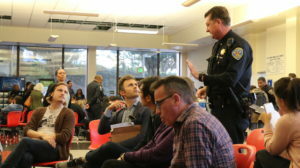 The Commission hastily arranged two “community meetings” on Tasers, and despite the lack of publicity or lead time, many DSA SF members turned out to both meetings. Although the stated goal of the meetings was to seek feedback from the public, uniformed and armed officers were on hand to push back against any criticism of Tasers. DSA SF members acquitted themselves well, armed with knowledge against anecdotes, and refused to back down. DSA SF has begun collecting postcards to send to the Police Commission, to demonstrate, once and for all, that the community wants less violence, not more weapons. Look for these cards at our events and please make your voice heard! DSA SF members have also been showing up to Police Commission meetings, and will keep showing up, and ratcheting up the pressure. The vote on Tasers may happen as early as November, and we’ll need all hands on deck. Please, join us!